The beautiful Mother of The Rainforest was an inspirational piece, representing our beautiful Tropical North Queensland Rainforest and how fragile it can be. Without Mother Nature looking after each aspect of the rainforest it will be lost to development and negative human intervention. We leave our footprint on the rainforest floor each time we step into it, take care we need it. 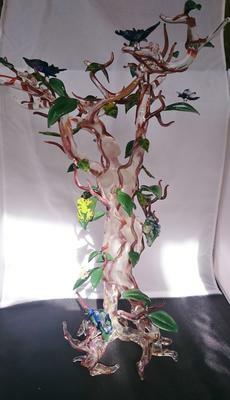 Raymond is a contemporary glass sculptor, with more than 20 years’ experience in the world of glass to date. His first encounter with the art was in Brisbane, Australia in the early 1980s while watching a glass sculptor create his pieces in a shopping center, which led to Raymond being taught the basic skills required for glass sculpturing. Several years passed. Raymond moved back to his home country of Malta, a small group of islands off the shores if Sicily. 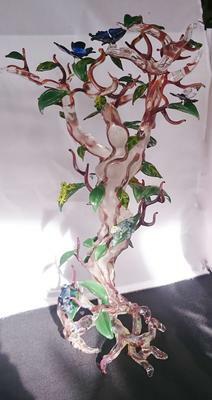 He opened a small glass sculpturing business in Malta, Glass Creations which was very successful for many years, creating pieces for weddings, birthdays, special occasions and unique pieces. Raymond also taught many children, including disabled children, the art of glass sculpturing in England, Malta and Australia. His glass art has also allowed him to work at Urban Glass, Brooklyn New York. Raymond returned to Australia from Malta in 1999, with glass sculpturing work arranged in Kuranda, Far North Queensland. During the years Raymond has exhibited his pieces across Australia and, whilst entering the Ranamok Glass Prize in Canberra, his piece “ New Life” was commissioned by Corning Museum, Corning United States. Throughout the years his pieces have been sold internationally including to Mark Webber and Rolling Stones. Lovely work, Raymond. Is your work currently on display somewhere in Cairns? At the moment I am preparing work for several exhibitions but only sell small pieces in a couple of locations in Cairns, I generally submit my work to gallery only. Click here to return to Your recent artwork.